Environmentally safe. All natural. Effective. Quite simply the best pool clarifier available on the market. Granting the power to quickly clear cloudy water, SeaKlear Natural Clarifier by HaloSource is the smart choice when it comes to your pool chemicals. It allows pool owners the ability to prevent cloudiness and quickly remove even the most challenging swirls of oil and dirt in swimming pool water. 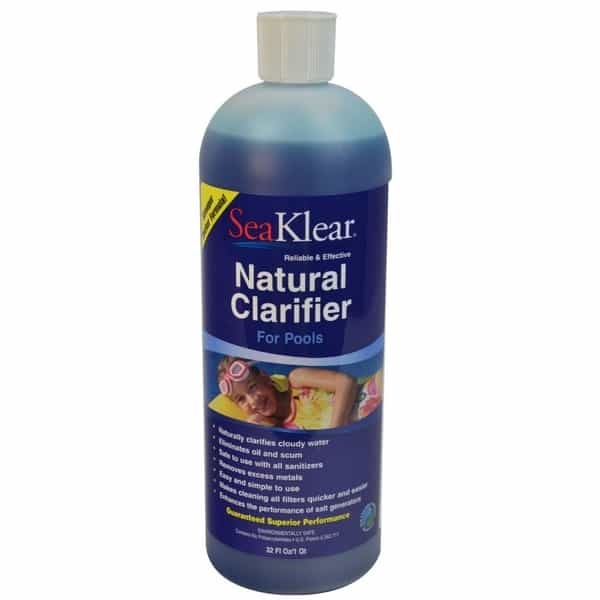 What is the secret behind SeaKlear Natural Clarifier? Recycled crab shells. Yes, this all-natural pool clarifier offers a chitosan-based formula derived from the crushed shells of crabs. So not only will you have sparkling water to dive in this summer, but you will feel good knowing your swimmers are not splashing around in heavy harmful chemicals... Plus, you are using a recycled product! So swim this summer with HaloSource's flagship product, the SeaKlear Natural Clarifier that comes with free shipping nationwide from your friends at Family Leisure! Weekly Maintenance: One ounce for every 10,000 gallons of water. Run pool filter six to eight hours. Jump in! Cannonball! One Time Dose; For Cloudy water: Between two and four ounces for every 10,000 gallons of water. Run pool filter six to eight hours... Your done! Dive in! But only in the deep end!